Sometimes we can make the biggest statements with the littlest of effort, and when it comes to style, this is no different. This week, we go back to basics and get a runway look for less than $100. The Designer Look: Balenciaga throws together a flawless chic look with a thick strapped white tank and rust colored trousers matched with leopard peep toe heels. And there you have it, a simple look with a bold statement all for $100. 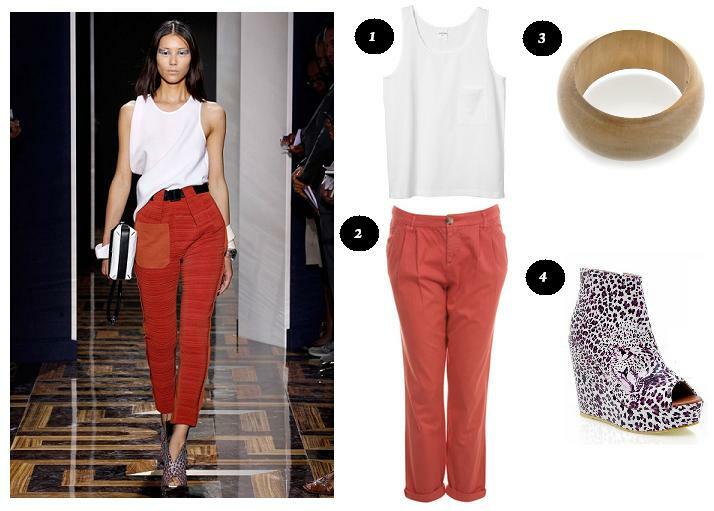 The best thing about this look, aside from its obvious versatility, is that the terracotta pants can easily be taken throughout all the seasons. An outfit like this easily benefits from a wild print or a bold color, and that’s why the purple and white leopard print heels are an awesome choice. If you have an outfit you would like us to put together with a $100 budget, simply shoot our editors an email, and let us do the rest!